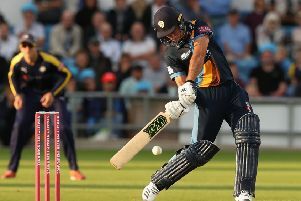 Colin Ingram missed out on what would have been his maiden first-class century for Glamorgan when he became another victim for Mark Footitt before rain again held up the LV County Championship Division Two match against Derbyshire at Chesterfield. The South African added 16 to his overnight 73, taking boundaries from the first two overs of the second morning to complete the 100 stand with Craig Meschede in only 15 overs. He had hit 19 fours in his 89 when he carved Footitt, who was again watched by National Selector James Whitaker, into the hands of Tony Palladino at deep backward point. That ended a stand of 117 in 18 overs with Meschede who passed 50 in the championship for the fourth time this season and with former Derbyshire all-rounder Graham Wagg, took Glamorgan to 216 for 4 when rain forced the players to take an early lunch at 12.30pm.